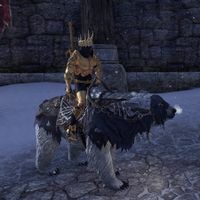 This Flame Atronach-themed bear is available as an Apex-level reward in Flame Atronach crates. Its default name is "Scorchbear". 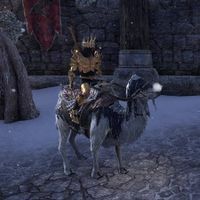 This Flame Atronach-themed camel is available as an Apex-level reward in Flame Atronach crates. Its default name is "Hotter-than-Sand". 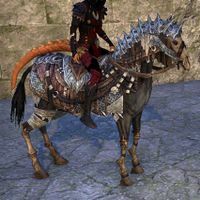 This Flame Atronach-themed horse is available as an Apex-level reward in Flame Atronach crates. Its mane, tail, and feathers are not hair, but literally fire. Its default name is "Firemane". 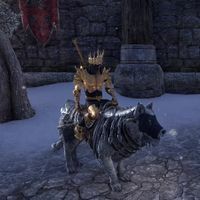 "An oversized Flame Atronach Wolf makes for an impressive mount," wrote arch-conjurer Corvus Direnni, "but it's inconvenient to house such a steed in flammable stables. When I'm not riding mine, I temporarily lodge it in a pocket realm Adjacent Place." 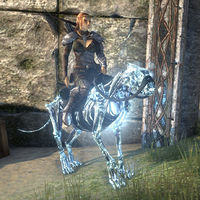 This Flame Atronach-themed wolf is available as an Apex-level reward in Flame Atronach crates. Its default name is "Flameloper". 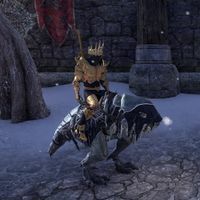 The Frostbane Bear was available from the Crown Store in the Crown Crates as an Apex-level reward. Its default name is "Tsunny". 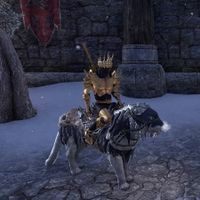 The Sacred Wolf was one of the most revered Atmoran animal totems, associated by later Nords with the goddess Mara. 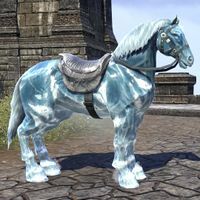 The great Frostbane Wolf is therefore one of the most iconic mounts of the ancient Nords. 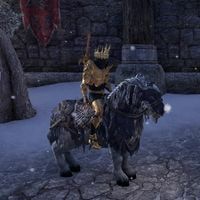 The Frostbane Wolf was available from the Crown Store in the Scalecaller Crown Crates as an Apex-level reward. Its default name is "Totem Eyes". This page was last modified on 3 April 2019, at 18:46.